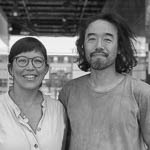 Masahiro and Yumi Takahashi moved to Sydney, bringing with them very particular aspects of their Japanese heritage. 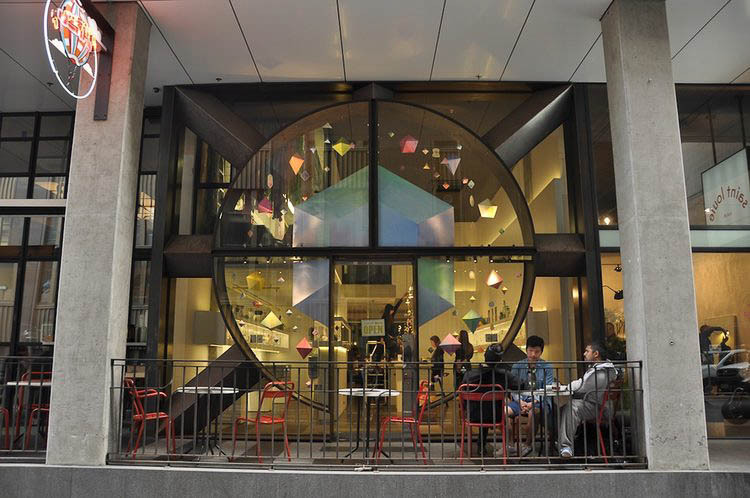 Their twin projects of Sakenet and Dear Plastic reveal how their heightened sensitivity for the taste and colour can be realised on the other side of the world. A key issue for Taka is the question of whether saké should be consumed cold or hot. His case for hot saké tells us about his commitment to culture as a living concern. I (Taka) was born in 1973 a small paper industry town in Ehime Japan. My father introduced saké to me when I was seven years old or younger. At the time, I have never seen adults drink saké cold in a small town in the countryside of Japan. People always heated their saké, even if they are good or bad, cheap or expensive. Luckily my hometown had a good saké maker, and I had good experiences with saké when I was young. However, the 1980s is the time when the consumption of saké in Japan started dropping down. Many Japanese people had bad experiences by drinking poor quality saké because most of the saké in Japan were bad quality at the time. This means the most of Japanese people who were born after the 1930s know only bad hot sakés. I remember I have struggled to find good saké (for me) in Tokyo when I was the 20s. In the 1980s, some saké makers started producing dry and light flavour saké. This type of saké became very popular in Tokyo. Then in the 1990s, an expensive “Ginjo” style was introduced and it became popular under the Japanese bubble economy. Many saké makers shifted to produce sakés using high polished rice, with fruity aroma and sweetness. Also, they promoted these sakés to be consumed cold. Actually, they tasted better at cold temperature, because of the aroma and sweetness. Those Ginjo Saké makers, including huge (mega) makers, made TV CMs and marketing campaigns of cold Ginjo Sakés. And many Izakayas (Saké bars) liked them because serving cold saké is much easier than serving Kan-zaké for them. However, they could not stop the decrease in saké consumption. Many sakés of this period are disappearing from the market now. Then saké makers, the saké making association of Japan, and the Japanese government started promoting some new style sakés in the 2010s. Many of them are like wine (especially white wine) and they are suitable to be consumed by using wine glasses. It may be a good direction for spreading saké to the outside of Japan and introducing saké to wine drinkers. But we need to be very careful about taking this direction. There is also another direction in the saké industry in Japan, which is to return to the classic. Some makers, distributors, saké bars and consumers work together and they created a group of promoting the classic sakés and the culture of Kan-zaké (warm/hot Saké). Japan had been losing much of its own culture, and much of it has been taken over by Western cultures, or Westernised. Saké is also being Westernised and the original culture of saké is in danger. This is why Sakenet Australia is working as a part of this group for saving the Japanese Saké culture. Because we love its original form. As I mentioned before, saké was always consumed as Kan-zaké in the 1980s and before. This means saké has been consumed as cold for only the last 30 years. But saké has more than 1,000 years history. The manner of serving and imbibing saké, the saké ware, is also part of the culture too. Cooking some nice food and heating saké well is showing hospitality for guests. 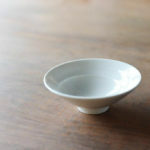 Also, you need to pour saké for the guest (or a friend) many times if you use traditional saké cups (choko or hirahai). The reason why saké cup is small is to finish saké before it gets cold. But another reason is to keep conversation with those you drink with. Usually, you cannot pour saké for yourself, unless you are alone. You have to wait to receive saké from your friend. You have to keep your eyes on your friend’s cup and pour for him/her when it is empty. Saké has many different acidities. And most of them taste better at a higher temperature. Lactic acid and succinic acid are main acids of classic (and modern) saké. and these acids are good at warm or hot. This is a reason why saké taste better when it is heated. Modern saké also has the same acids, but they have also strong aroma and sweetness. With the aroma and sweetness, modern saké does not very good at warm or hot temperatures. Special types of yeast are used for creating a higher aroma. However, some contemporary sakés have different types of acidity. They may be similar to wines’ acidities, and these acidities are better at cold temperature. For creating those acidities, makers use special techniques, yeast or koji-mould. 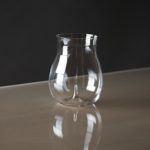 It is not only the temperature which is important for consuming sake, it is also the kind of cup you use. There are at least four different types of saké cups. 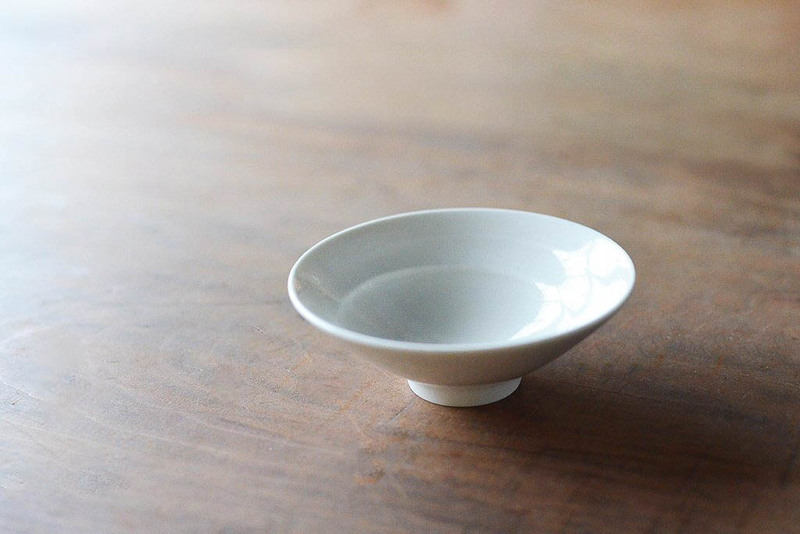 This is the oldest style of saké cups. There are two different types of hira-hai. One is made of wood (lacquerware), and the other is ceramics. 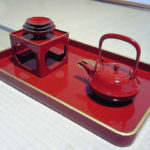 Lacquerware hira-hai is generally bigger than ceramic hira-hai. 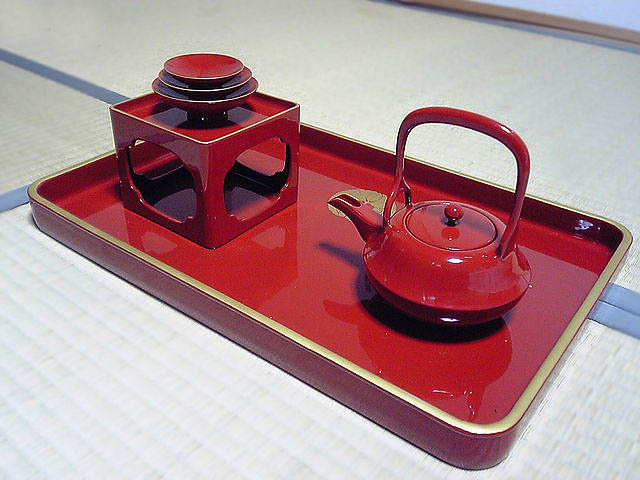 Long time ago, lacquerware hira-hai was used by nobilities and upper class Samurais. Other people usually used ceramic hira-hai for drinking saké. 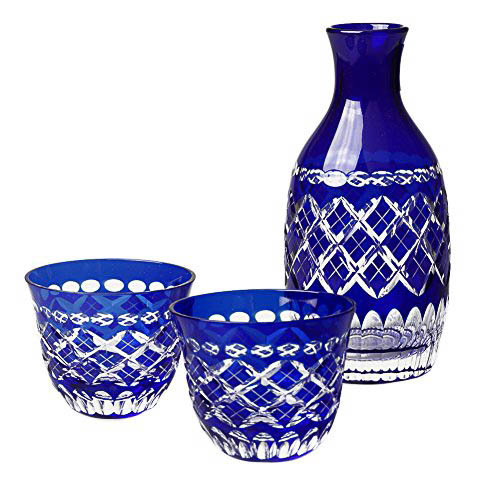 However, they used lacquerware hira-hai at special occations, like wedding ceremonies.For using lacquerware to drink Saké, there are a few steps.a) Heat up saké by using chirori (Saké kettle).b) Transfer heated saké from chirori to cho-shi (Teapot shape Saké pourer, this is also a lacquer ware. )c) Pour saké from cho-shi to hira-hai. This type of Saké cup appeared in the late Edo period (1603 – 1868). In Edo (Tokyo), Soba noodle was very popular and people loved to have Saké with Soba. When the mainstream of Saké’s drinking style was changed to cold, this type of sakéware became popular too. Usually, the shapes are same as saké choko, or like shot glasses. And some of them are Hira-hai shape. 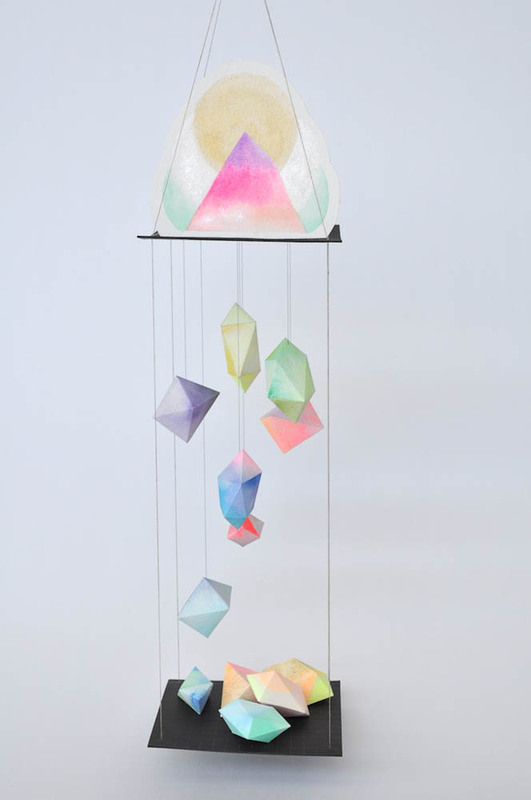 These glass chokos were very popular when I was young (in Tokyo). Drinking Saké with wine glasses are very popular now. Some makers develop and call them “Sake glass”. RIEDEL developed “Daiginjo glass” a few years ago, and they released “Junmai glass” this year. 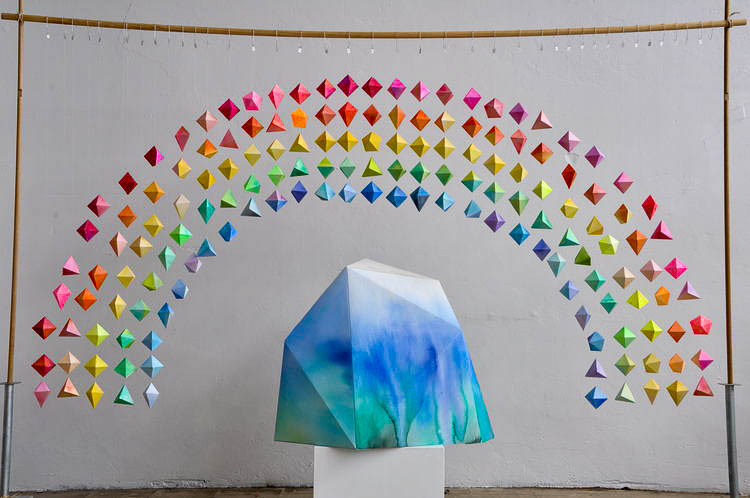 Rainbow Mountain, Dagmar Rousset window installation. Dear Plastic is a collaboration between Yumi and Taka. 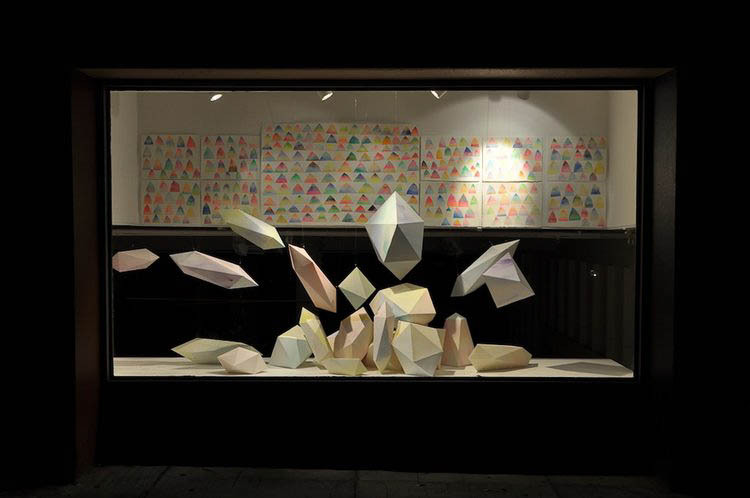 We create artworks and installations around ideas of everyday happiness. The environment and respect for our planet plays a big role in our work. 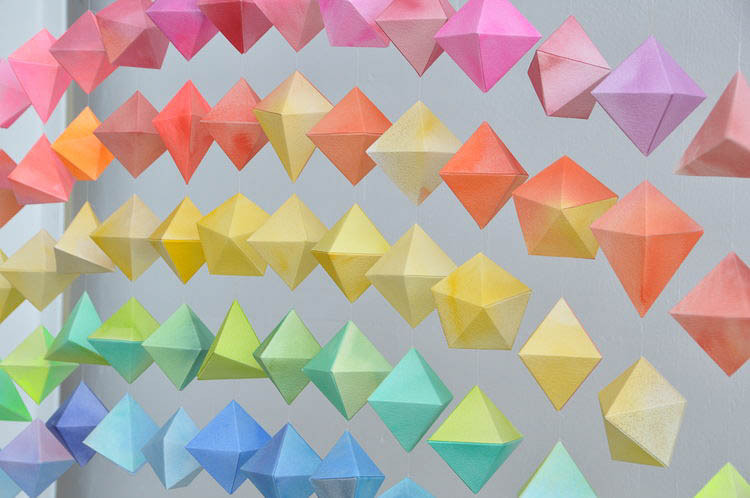 This has always influenced our material choices and paper has played a big part in our work up until now. We create for children and adults alike. 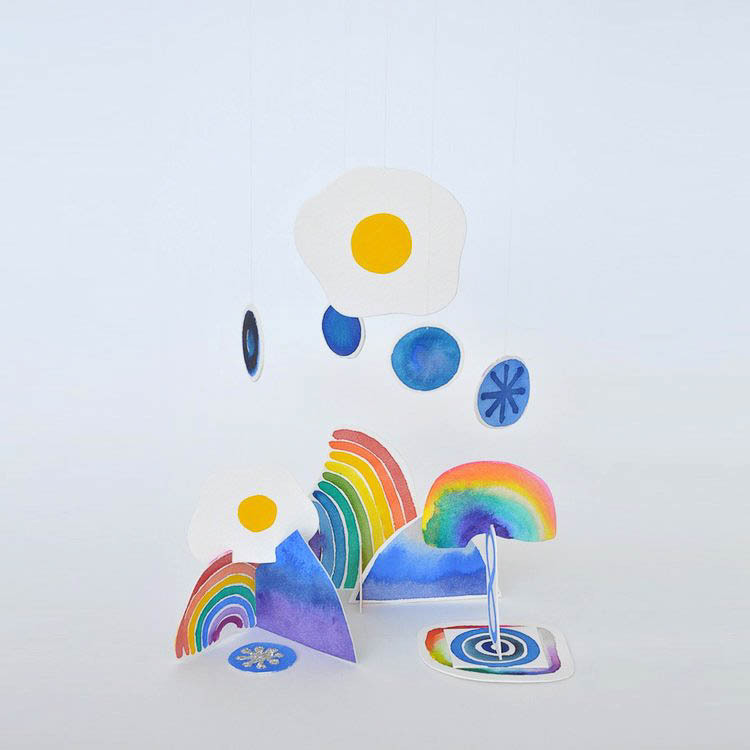 We are inspired by imagination, colour and creating a world that spreads happiness.